The Godot community is rich and international. Users come from all around the world. Some of them are young, and many aren’t native English speakers. That’s why we must all write using a clear and a common language. For the class reference, the goal is to make it easy to read for everyone and precise. Remove unnecessary adverbs and adjectives. A technical writer’s job is to pack as much information as possible into the smallest and clearest sentences possible. These guidelines will help you work towards that goal. Use the direct voice when possible. Take the classes, methods, and constants you describe as the subject. It’s natural to write using the passive voice, but it’s harder to read and produces longer sentences. The man **was bitten** by the dog. [...] This method **is implemented** only in some nodes that inherit Node2D. [...] Only some Node2Ds **implement** this method. Favor precise yet common verbs over generic ones like make, set, and any expression you can replace with a single word. Do explain what’s the consequence of this “set”: use precise verbs like place, position, rotate, fade, etc. The progressive forms describe continuous actions. E.g. “is calling”, “is moving”. Don’t use the progressive form for instant changes. Do use simple present, preterit or future. You may use the progressive tense to describe actions that are continuous in time. Anything like animation or coroutines. Verbs can turn into adjectival nouns with -ing. This is not a conjugation, so you may use them: the remaining movement, the missing file, etc. Write as few adjectives and adverbs as possible. Only use them if they add key information to the description. Game creation and programming aren’t simple, and nothing’s easy to someone learning to use the API for the first time. Other words in the list, like just or actual won’t add any info to the sentence. Don’t use corresponding adverbs either: obviously, simply, basically, easily, actually, clearly. Control frame that **simply** draws an assigned texture. It can stretch or not. It's a **simple** way to **just** show an image in a UI. [Control] node that displays a texture. The texture can stretch to the node's bounding box or stay in the center. Useful to display sprites in your UIs. Calls a function of your choice after a certain duration. Vector class, which performs **basic** 3D vector math operations. Provides essential math functions to manipulate 3D vectors: cross product, normalize, rotate, etc. Favor explicit references over implicit ones. Don’t use words like “the former”, “the latter”, etc. They’re not the most common in English, and they require you to check the reference. [code]w[/code] and [code]h[/code] define right and bottom margins. The **latter** two resize the texture so it fits in the defined margin. [code]w[/code] and [code]h[/code] define right and bottom margins. **[code]w[/code] and [code]h[/code]** resize the texture so it fits the margin. If you need to repeat the same variable name 3 or 4 times, you probably need to rephrase your description. Avoid “The milk of the cow”. It feels unnatural in English. Write “The cow’s milk” instead. The region **of the AtlasTexture that is** used. The ‘Oxford comma’ is an optional comma before the word ‘and’ at the end of a list: We sell books, videos, and magazines. […] Not all writers and publishers use it, but it can clarify the meaning of a sentence when the items in a list are not single words: These items are available in black and white, red and yellow, and blue and green. Create a KinematicBody2D node, a CollisionShape2D node and a sprite node. Do add a comma before and or or , for the last element of a list with more than two elements. Create a KinematicBody2D node, a CollisionShape2D node, and a sprite node. It’s the only description in the “Create New Node” dialog. The brief description should explain the node’s role and its functionality, in up to 200 characters. Base node for 2D system. 2D game object, parent of all 2D related nodes. Has a position, rotation, scale and z-index. Use the node’s full description to provide more information, and a code example, if possible. Some methods return important values. Describe them at the end of the description, ideally on a new line. No need to mention the return values for any method whose name starts with set or get. [...] The returned vector is how much movement was remaining before being stopped. [...] Returns the remaining movement before the body was stopped. Notice the exception to the “direct voice” rule: with the move method, an external collider can influence the method and the body that calls move. In this case, you can use the passive voice. For boolean member variables, always use if true and/or if false, to stay explicit. Controls whether or not may be ambiguous and won’t work for every member variable. Also surround boolean values, variable names and methods with [code][/code]. If [code]true[/code] the timer will automatically start when it enters the scene tree. Default value: [code]false[/code]. In the class reference, always surround arguments with [code][/code]. In the documentation and in Godot, it will display like this. When you edit XML files in the Godot repository, replace existing arguments written like ‘this’ or `this` with [code]this[/code]. The developers chose some specific words to refer to areas of the interface. They’re used in the sources, in the documentation, and you should always use them instead of synonyms, so the users know what you’re talking about. In the top left corner of the editor lie the main menus. In the center, the buttons change the workspace. And together the buttons in the top right are the playtest buttons. The area in the center, that displays the 2D or the 3D space, is the viewport. 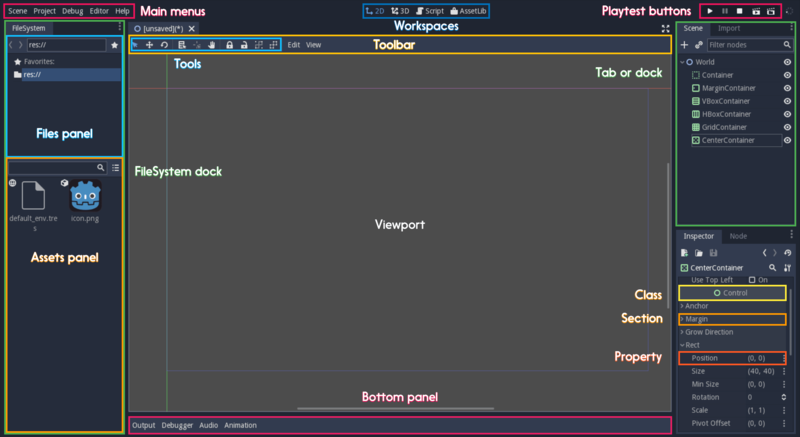 At its top, you find a list of tools inside the toolbar. The Animation, Debugger, etc. at the bottom of the viewport are panels. Together they make up the bottom panels. Foldable areas of the Inspector are sections. The node’s parent class names, which you can’t fold, are Classes e.g. the KinematicBody2D class. And individual lines with key-value pairs are properties. E.g. position or modulate color are both properties. A significant part of the documentation is images, and there are several important guidelines to follow. First, you should always be using the default editor theme and text when taking screenshots. Screenshot size should not exceed 1920x1080. When you need to highlight an area of the editor to show something, like a button or option, use a 2 pixel thick outline without a bevel. Before you add or replace any images in the documentation, they should be run through a png compressor to save size. The built in lossless compressor in programs like Krita or Photoshop should be done. However you should also use a lossy one, such as pngquant where almost no image quality is lost during compression.